Organizers were surprised by an unexpectedly strong turnout when nearly 1,000 high school students walked out of class to protest education cuts in Sarnia last week. “I thought there’d maybe be 80 from our school, but once kids started walking out there was no stopping them,” said Gabrielle Olson, a Grade 12 student at Northern Collegiate. 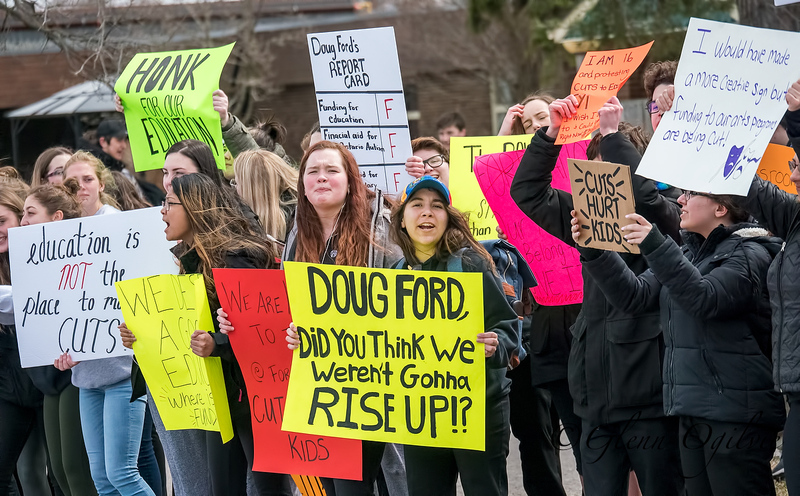 About 700 placard-waving students from Northern and St. Patrick’s High School demonstrated at the intersection of Murphy Road and Michigan Avenue, joined by a small number from Alexander Mackenzie Secondary. “We are the future of this country and they shouldn’t cut teachers or programs if they want well-educated leaders,” Olson said. “This shows how many students really care,” said Aiden Healy, a Grade 10 student at St. Pat’s. Elwood, 16, said students tell her they’re concerned about increases in high school class size and cuts to free post-secondary tuition for low-income earners. Education Minister Lisa Thompson announced last month class sizes will increase in Grade 4 through Grade 12, with a reduction in teachers. The average class size is expected to increase to 28 from 22 students, which Thompson said will put Ontario in line with other provinces and benefit students by making them more resilient. The government is also requiring high school students to take four courses online starting in 2020. At least 200 more students protested outside Great Lakes Secondary School during last class. Grade 10 organizer Hannah George said she registered her school with the ‘Students Say No’ movement when she realized how far-reaching the Ford government cuts will be. Students Say No signed up more than 700 schools provincewide for the afternoon protest and urged students to keep it respectful and safe. 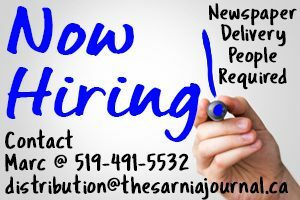 In Sarnia, the 90-minute protest took place peacefully and with a heavy police presence. St. Clair District Catholic School Board superintendent Scott Johnson attended and said he was pleased by how students conducted themselves. “I’m simply here to observe,” he said. Hundreds of drivers passing by honked horns and gave thumbs-up to the protesters. The louder the horns, the louder the students cheered. “I’ve never witnessed anything like this before,” said Johnson, who confirming none of the students cutting class would face disciplinary measures. Across the community, elementary students as young as 11 supported the high school protest with their own demonstrations. Grade 8s from Bridgeview School in Point Edward rallied at Front Street and Michigan Avenue, while students on recess at Ecole elementaire Les Rapides held placards and chanted in their yard. “Ford is cutting budgets and teachers for our schools and we don’t think it’s right,” said 11-year-old Parker Elliott. During question period at the Ontario legislature that day, Premier Ford said the walkout should have been stopped. “Our teachers have a responsibility to the parents, to the students, to make sure they stay in the classrooms and teach the students,” he said. “It’s absolutely shameful they’re using our students for a bunch of pawns,” added Ford.